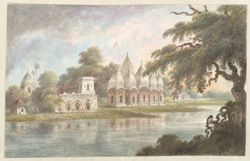 Watercolour of temples in Santipur along the Bhagirathi River from an album of miscellaneous views of Bengal produced for Lord Moira, afterwards the Marquess of Hastings, by Sita Ram between 1820-21. Marquess of Hastings, the Governor-General of Bengal and the Commander-in-Chief (r.1813-23), was accompanied by artist Sita Ram (flourished c.1810-22) to illustrate his journey from Calcutta to Delhi between 1814-15 and his convalescent tour in the Rajmahal Hills in the winter of 1820-21. Idealised view of temples by the Bhagirathi at Santipur in West Bengal. Santipur was once a centre of the weaving industry with several large factories for the East India Company. Santipur is famous for the Rash Jatra festival in celebration of Krishna on the day of Kartik. Inscribed below in pencil and ink: 'Nuddeah Santipore.' Note: It is by no means clear whether Nadia or Santipur is here intended, as the river has washed away riverine buildings in both.